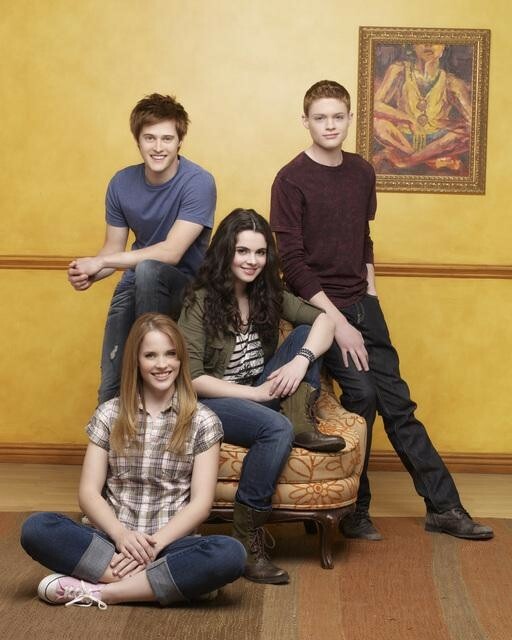 As you know, I love Switched at Birth (Monday at 8 p.m. on ABC Family). The show is educational without being preachy. It pulls you into the teenage drama and angst without being tawdry. I so appreciate that Bay (Vanessa Marano) and Daphne (Katie LeClerc) have age-appropriate problems. They’re not acting like they belong on The Real Housewives of Kansas City. The series also gives the adults on the show their own issues and problems. While the children are the center of their world, their worlds don’t completely revolve around the children. John (D.W. Moffett) is running for office. Regina (Constance Marie) struggles with sobriety. Kathryn (Lea Thompson) is carving out a career for herself and not at all happy simply being the political wife. And even when the show goes down a cliched path (Daphne’s brief romance with the chef last year), it still surprises me with the outcome. When I was in LA last month, I had the chance to visit the set of the series with my fellow TV critics and talk to the series creator Lizzy Weiss about the show’s upcoming all American Sign Language episode (next Monday, March 4). You can read my story about my visit to Switched at Birth here. I’m also giving away the book “Switched at Birth: The True Story of a Mother’s Journey” by Kathryn Kennish. Post a comment about why you love the show by Friday, March 1 at 5 p.m. ET. I will pick a winner at random from all the comments. This entry was posted in Contests & Giveaways, Switched at Birth and tagged Lizzy Weiss by TV Gal. Bookmark the permalink. The first reason I love the show is the two leads – Bay (Vanessa Marano) and Daphne (Katie LeClerc). They are both charming and have built two very interesting characters. I really enjoy D.W. Moffett playing a good dad after his time as the evil Dad on Friday Night Lights (he was the Dad, you loved to hate). Lea Thompson is great as is Constance Marie. The stories are good, I enjoy the family dynamics and the teen angst but what really sets the show apart is the exploration of a culture I know nothing about. I can’t multitask while watching this show because I’ll miss half the dialog when the characters use American Sign Language. I enjoying seeing this different world. I adore this show. It gives us a glimpse into the world of deaf culture. This has never been dealt with before to this level on any TV series. The writing is excellent, and so is the acting. I look forward to it so much each week! As a deaf person, this is the first time in my life that I have been able to watch a show and have multiple characters I can truly relate to in different ways. Yes, I relate to some of the hearing characters, too, particularly the adults (being an adult myself). But having deaf characters in the program allows me to relate to various aspects of my daily experience that I don’t normally get to see on the screen at all. And that’s a real novelty for me. I have loved this show since the pilot. Everytime I think I know what is going on, they throw me a curveball and go the other way. All of the conflicts are believable, the characters are built so richly but also each have a minor flaw to keep them from being completely perfect. I look forward to it every week.